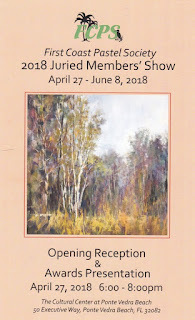 This year we had a lovely evening for the opening reception of our juried show, unlike last year when we held our reception during what seemed like a monsoon. It was great to look at our program and see the large number of our members who participated in our show. What a variety of work we have! We were so lucky to have Christine Ivers come down all the way from Connecticut to be our judge, and to conduct our upcoming workshop this week. As usual we had amazing food, and plenty of it, and a big turnout of guests. Thanks to all who brought food, all who helped set up, all who helped prepare for this marvelous show in any way. We also had plenty of wine, and plenty of customers who enjoyed it. We also have to thank our judge who spent a great deal of time writing down her impressions of each prize-winning painting, and the features that made each of the paintings stand out. Therefore, if you were not there tonight, you'll have to wait a little longer to find out who won! I've been promised a softcopy of the judge's remarks, and when I post the winning paintings here I want to make sure I include all the remarks that showed their wonderful qualities. 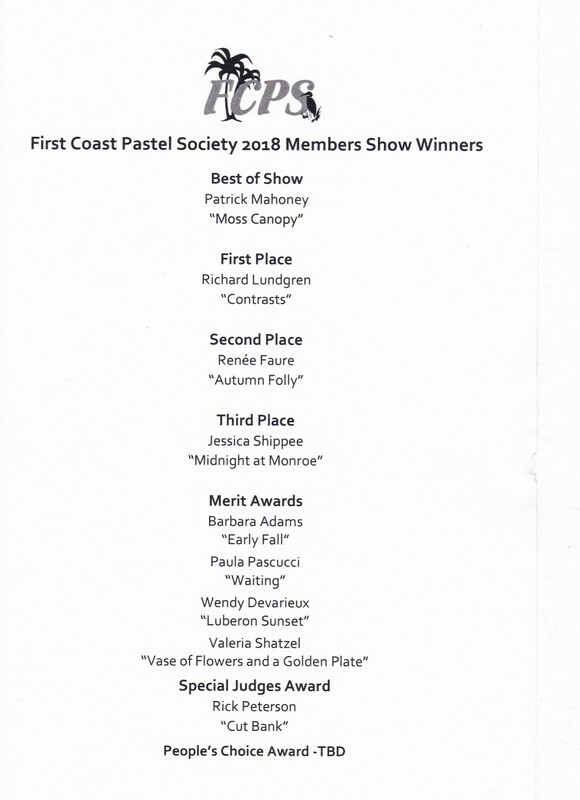 So congratulations to all our winners, but listed above are all our show entries. Congratulations to everyone who entered a piece in our juried show this year. Meanwhile, come see Chris's demo at noon tomorrow at the CCPVB. It should be awesome! Free for workshop participants, $10 for other members and $20 for non-members. We had a great presentation from Arlene Hanly on April 5. Arlene has had many years of experience as a professional framer. We had a great turnout too, with our big annual juried show coming up we had lots of folks interested in framing tips. Arlene also had good examples of good and not so good framing. I hope everyone got some great tips and had success in framing. Our big show opening is THIS FRIDAY! Our shows just get better and better every year, and I can't wait to be able to display here the winning pictures, and all the others as well. When I saw the amazing work at the receiving date for our show I knew our judge, Christine Ivers, would have her work cut out for her. I'd sure hate to be the one making the choices. Okay everyone, keep in mind these weekend dates! I hope you've all seen your reminder emails. Saturday it's time once again to get together for our general meeting, and we hope people will happily turn out with this nicer weather we are having. Our juried show is coming up so it's time to get our accepted pieces framed and ready to go. If you have questions bring them on Saturday. Artist Arlene Hanly will be there to give us tips and advice about framing. If you have any good tips of your own please bring them along to share with the group. I have one tip I'll pass along freely right here. If you are in need of D-rings to attach your hanging wire you don't need to travel to a specialty art store. They can be purchased locally at your nearest Lowe's. 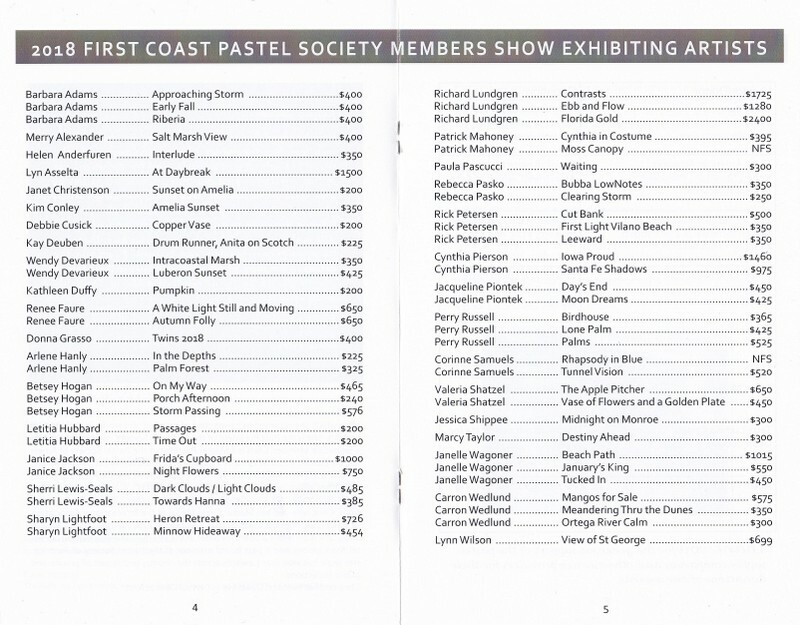 Want to know what's coming up with the First Coast Pastel Society? Just scroll to the very bottom of our blog and you will find our calendar of events. The details are not always there, but the dates as we know them should be correct. Remember we have either a meeting or a plein air event on the first Saturday of the month from September to June. If the details for an event are not there please check back. The calendar will be updated as soon as we have the information. 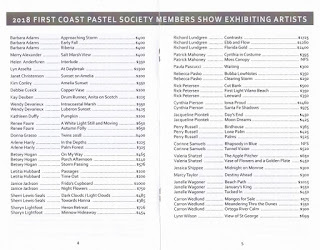 The First Coast Pastel Society is based in northeast Florida, covering Jacksonville, St. Augustine, and points north, west and south, and was started in January of 2012. 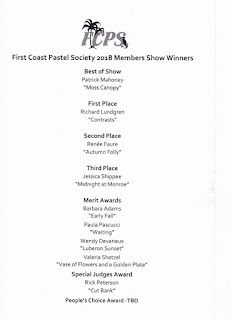 Our goal is to reach out to pastel artists in the northeast Florida and southeast Georgia area who, until now, have not had a local pastel society to belong to. "To promote the use of soft pastel within the FCPS membership and the community at-large as an important and continually evolving fine art medium." The charge for borrowing library materials is $2.00 per item for a period of 2 months. If no one is waiting materials may be renewed for another 2 month period for an additional $2.00 charge per item. Materials must be returned after 4 months of consecutive check out. Failure to return materials after 4 months will result in continuing charges of $1.00 per month until the items are returned up to the maximum of $6.00 per item in fines. Failure to return items will result in a replacement charge to cover the cost of repurchase. A copy of the item in good condition will also be accepted. Outstanding fines must be paid and items overdue more than 6 months must be returned or replaced in order to be eligible to participate in the annual juried show.